These are absolutely fantastic as appies or as a side dish. make sure you serve them hot out of the pan so the cheese stays gooey and soft. 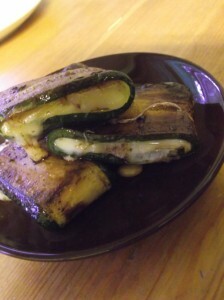 my husband hates zucchini and even he liked these little packages of happiness…. Slice the zucchini length wise as thin and straight as possible. A mandolin works best for this because if they are too thick they will not fold without breaking. Slice the cheese in thick squares big enough to cover 1/3 of zucchini. Lightly saute the zucchini strips in olive oil & balsamic until they are soft and remove from pan. Place cheese on the end third of soft zucchini and press in a few pine nuts. Fold the zucchini so the cheese is in the center of a tightly wrapped parcel. Pan fry on med in remaining balsamic until warm right through and cheese begins to melt. Sprinkle with salt & pepper. A good alternate version would be to add sun dried tomatoes or chopped olives.